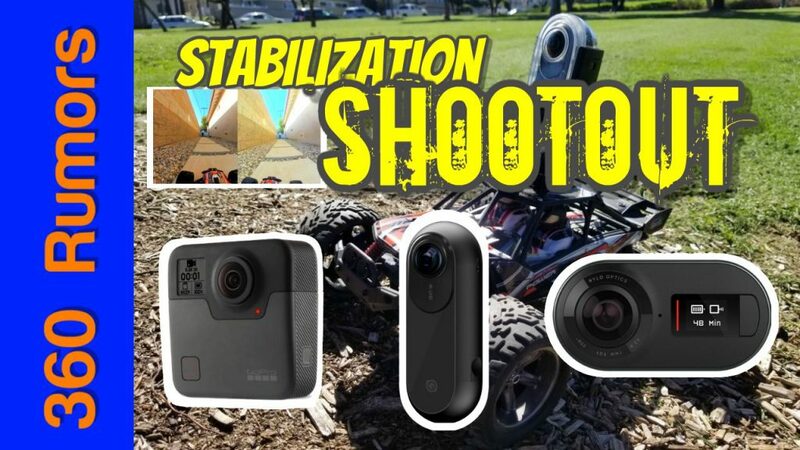 Which 360 camera has the best stabilization? I compared the three 360 cameras with the reputation for having the best stabilization in this head-to-head comparison. Can you guess how they ended up ranking? In this comparison, I compare the Insta360 One (reviewed here), GoPro Fusion (reviewed here), and Rylo (reviewed here) for stabilization performance. To compare them, I used the R/C Carnage test from my Flowstate demo video. 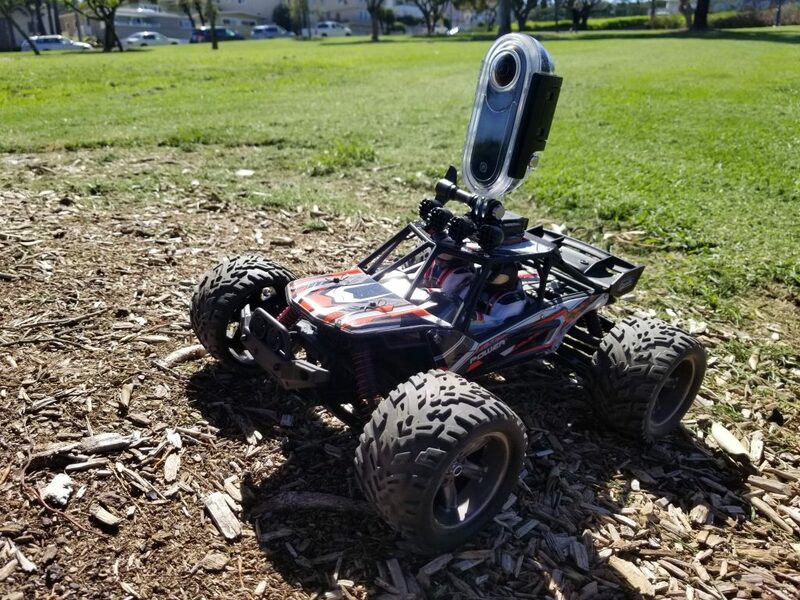 In case you’re not familiar with the RC Carnage test, basically I mounted the 360 cameras on an R/C car and went over grass, gravel and pavers. With the RC’s small size (1:12), obstacles became proportionately larger, making it look very much like a mountain bike video. This time, for this comparison, I mounted the cameras two at a time, in round robin format to make sure we’ll know which of them is the best. – With an equirectangular view, you’ll see the undulating horizon, but you won’t get a realistic sense of how the video will actually look (no one watches in an equirectangular view…). Moreover, small movements are harder to see in an equirectangular view. – With a 360 view, you’ll get a good sense of how the video will look. But it’s hard to compare more than two at a time. Moreover, even if you split the screen and put a camera on one side, and the other camera on the other side, you will only see half of the screen. This comparison method is also a bit awkward when the cameras have different stabilization modes (camera heading vs. compass heading). – With an overcapture view, you will also get a good sense of how the video will look. It is also possible to compare two or more cameras side by side. It’s true that you can’t look to the side or rear, but if the purpose is to compare cameras, then you probably won’t turn around to look at the rest of the 360 view anyway. In terms of editing, overcapture view actually takes the most amount of work, but I think it is the best format for this comparison. Insta360 One vs. GoPro Fusion: Insta360 One and Fusion had similar performance for the gravel test. For the paver test, Fusion was slightly better (less movement during bumps). For the grass test, the One was rolling more significantly compared to the Fusion in full stabilization mode. Insta360 One vs. Rylo: This comparison was trickier because Rylo and Insta360 One have different stabilization modes. Rylo maintains a constant camera heading, while Insta360 One maintains a constant compass direction heading. Nonetheless, I was able to compare them by looking at the horizon. The result was similar to Round 1. Insta360 had the same performance as Rylo for gravel. For pavers, the Insta360 One was bouncing more than Rylo. The biggest difference was for the grass, where the Insta360 One had noticeably more rolling than Rylo. GoPro Fusion vs. Rylo: This comparison was made easier thanks to Fusion’s two stabilization modes. First, I used the anti-shake mode, which maintains the camera heading, like Rylo. With the gravel and pavers test, the Fusion looked similar to Rylo. However, with anti-shake mode, it appears that Fusion roll stabilization performance is not that great. You can see the Fusion video swaying noticeably, although the video is still stabilized. Next I tried Fusion’s full stabilization mode. In this mode, the Fusion was just as stable as the Rylo in all three parts of the test. Even when I fast-forwarded the video to exaggerate any differences beween them, I couldn’t find any difference between Fusion and Rylo. – Rylo: 9.0. Its performance is a huge improvement from the stabilization of average 360 cameras of February 2018 (my baseline). – Fusion: 9.0. Although Rylo had slightly better performance (less roll in anti-shake mode), Fusion has two stabilization modes, and moreover had equal performance in full stabilization mode, therefore I scored the Fusion 9.0 instead of 8.9. – Insta360 One: 8.7. There was a noticeable difference between Insta360 One on one hand, and Rylo and Fusion on the other, which meant a difference of 0.2 or 0.3. Given that the One has only one stabilization mode, it didn’t benefit from a 0.1 increase the way the Fusion did, therefore I scored it 8.7. According to Insta360, they will add the option to stabilize with the camera heading. If and when they do implement that, I expect the One’s stabilization score to improve to 8.8, or possibly higher. It goes without saying that stabilization is just one of several factors in choosing a 360 camera. And of course there are other stabilized 360 cameras. I’m going to compare them next time in a comprehensive comparison… stay tuned! I would like to see how the Garmin Virb scores again these. Definitely, Brian. 😀 But first, I must work on my ‘controversial’ video, which I hope to finish this weekend 😉 so that I’ll be able to post that comparison next weekend. Very useful know the camera’s stabilization capacity . You will think to insert the stabilization parameter in the comparative page? 360 TIPPING POINT: Can the GoPro Fusion replace your smartphone camera and action camera?